Hello to everyone out there and welcome to another edition of Mastication Monologues! Throughout the history of mankind, we have been plagued with many different types of natural disasters: earthquakes, floods, and volcano eruptions. The first two events are more common than the last one, but volcanoes seem to hold a special place in the place of the human mind in terms of threats from nature. They are so unpredictable and powerful like the eruption of Mount Vesuvius in 79 A.D. The cities of Pompeii and Herculaneum were completely covered in ash, and their inhabitants were flash frozen in lava casts. What does this have to do with food? Well, yesternight I tried the best Chicken Vesuvio ever at the oldest Italian restaurant in Chicago, Italian Village, located at 71 West Monroe Street Chicago, IL 60603. There are three different sections to the restaurant, and each area has its own theme. 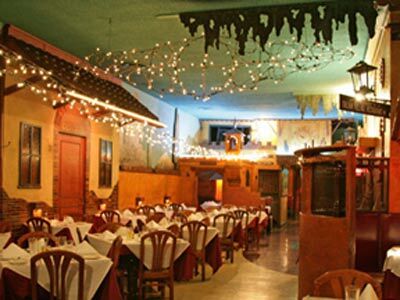 Even though it may sound a bit tacky/kitschy, we ended up dining in the quaint “Village” room upstairs. It was decorated with white lights strung across the ceiling like a big famiglia party I saw in San Gimignano, Italy, and there were mini village buildings along the walls that I assumed you could eat inside for an extra fee. Upon looking at the menu, I could see that the establishment definitely was well stocked with plenty of Italian American favorites like different types of Parmesans and stuffed pastas. We even received the typical basket of pane italiano and crispy breadsticks without butter. The olive oil and Parmesan cheese they provided at the table were high quality and made a great combo with the fresh, semi-crusty bread. 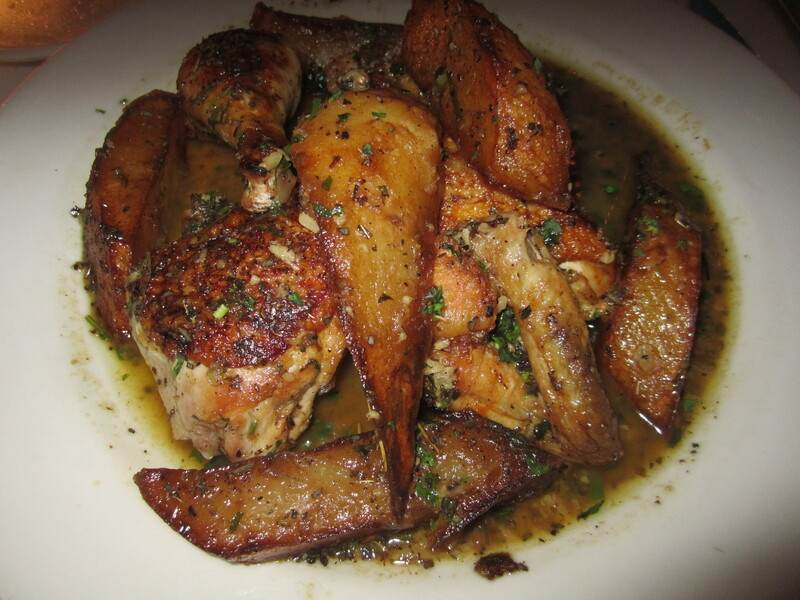 Between bites of the delicious carbs, I saw they served a classic Chicago Italian-American dish: Chicken Vesuvio. If I was going to dine at the oldest Italian restaurant in Chicago, I might as well get a meal invented in the same city. This dish also had to cook for thirty minutes, so I ordered a glass of the Barbera red wine. Plus, since I ordered one of the entrees, I had the choice of soup or salad. I decided to plump for a side salad with ranch dressing. The salad itself was nothing special. 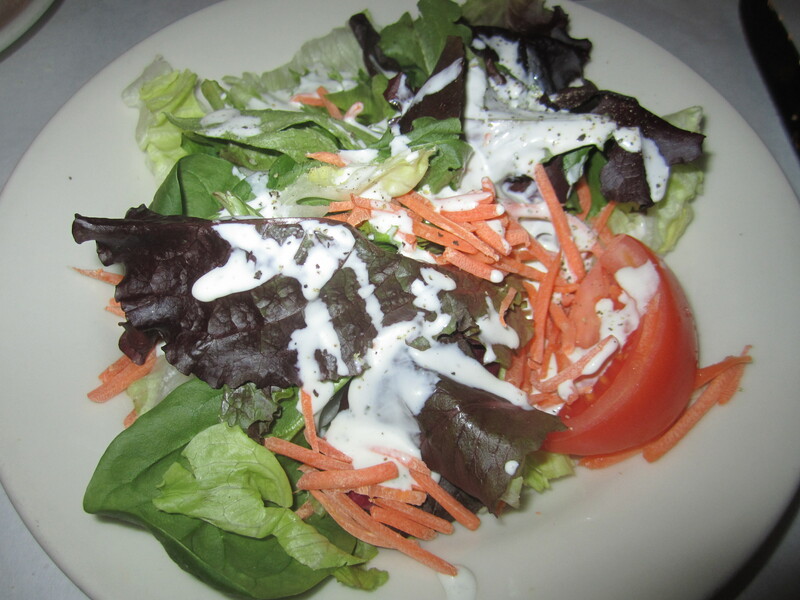 It had the typical mix of lettuce, mixed greens, a tomato slice, julienned carrots, and just the right amount of semi-watery Ranch. I was surprised for how fast they delivered the salad to me that the vegetables were so fresh and delicious. Perhaps they don’t prefabricate their salads and are just speed demons on the cook line. After waiting patiently, my Chicken Vesuvio came out. I was face to face with half a chicken and roasted potato wedges. Both the potatoes and chicken were herb encrusted, deep brown, and cavorting with each other in a delicious pool of herbs and chicken drippings. Sounds kind of like a season of the Jersey Shore. I decided to scale this gastronomic volcano of deliciousness, and it erupted with flavor from the first bite of a potato wedge. The tubers were semi-crispy on the outside with hints of rosemary and oregano, and the insides were pure white like the snow of the Italian alps. As for the chicken, the chicken broth made the meat extra succulent since it was literally falling off the bone. The best part of the meal was combining the crispy skin with the juicy white meat and dipping it into the broth. My Barbera wine went well with this savory dish even though it wasn’t really red meat. This Piedmontese libation was slighty acidic but bold; two attributes that really brought out the herbs of the broth and chicken skin. A word of caution: there might be some splatter with the broth while you’re cutting the chicken. So if you’re wearing anything fancy on that first date, don’t get too excited while tucking into this festa italiana. Once the smoke settled from this smoking cauldron of deliciousness, I was stuffed and satisfied with my choice. 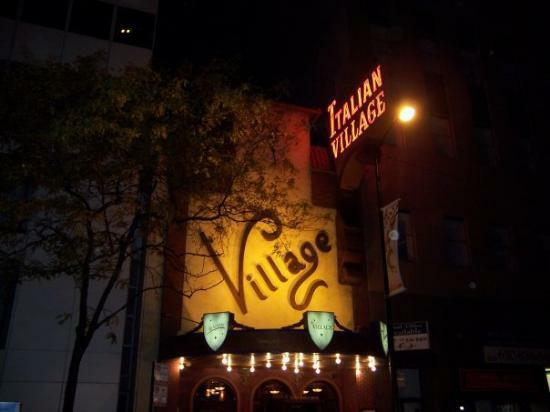 So if you want to experience a piece of authentic Chicago, Italian American cuisine, and/or believe that abbondanza is a virtue in cooking, remember that all roads lead to Italian Village! Posted in European Cuisine, Italian and tagged authentic, Bar, Beverages, bread, broth, Chicago, chicken, classic, dining, Food, Gourmet, grill, herbs, Illinois, Italian, oregano, potatoes, ranch, restaurant, Reviews, salad, sauce, tomato, wine. Bookmark the permalink. I ate here when I was in Kennedy High School , which was about 79A.D…..can’t remember what I ordered, but I liked the little train cars to dine in.